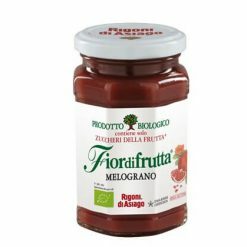 Organic pomegranate fruit spread; non-sugar. This delicious and very mild-tasting pomegranate fruit spread is made from organic pomegranates, organic concentrated apple juice and fruit pectin. It is very nice on bread or toast, with yoghurt, or partnered with a fresh goat cheese.